The order remains the same in the latest Off the Block/Springbak Division II National Coaches Poll that was released Tuesday morning but Barton picked up five more points, including three fourth-place votes. Lewis remained at No. 1 in the poll despite losing its only match this week — a sweep at the hands of Loyola. Lewis was led again by sophomore outside attacker Ryan Coenen who had 13 kills and eight digs. Lewis continues its home stand this weekend with crucial conference matches versus Fort Wayne and Ball State. Concordia-Irvine stayed at No. 2 after being swept in conference matches at UCLA and Pepperdine. In each those two matches, the libero Jacob Weiser had double-digit digs. Concordia-Irvine travels to Arizona this weekend to play Grand Canyon on Friday, and a pair of NAIA opponents on Saturday. McKendree remains No. 3 in the coaches poll following a four-game win against Lindenwood. The Bearcats hit more than .400 in the three games they won, and were led by senior outside attacker Jared Wilcox’s 14 kills. McKendree this week travels to Quincy for a conference match before hosting Princeton for a pair of non-conference matches. UC San Diego maintains its No. 4 despite dropping a pair of matches to UC Irvine. The Tritons forced the Anteaters to five games in the series finale and four Tritons in that match had double-digit kills. UC San Diego was without senior opposite Tanner Syftestad, who leads the nation in attack and kills per set. This week UC San Diego is off because of final exams. Barton rounds out the top-five poll but picked up five additional points from last week’s poll. The team has nwon nine matches in a row after picking up Conference Carolina wins against Erskine and Emmanuel last week. The Bulldogs play three matches this week. Barton travels to Coker before playing host to North Greenville and Limestone. Both NCAA Division I and NCAA Division II men’s volleyball programs compete for the same national championship. 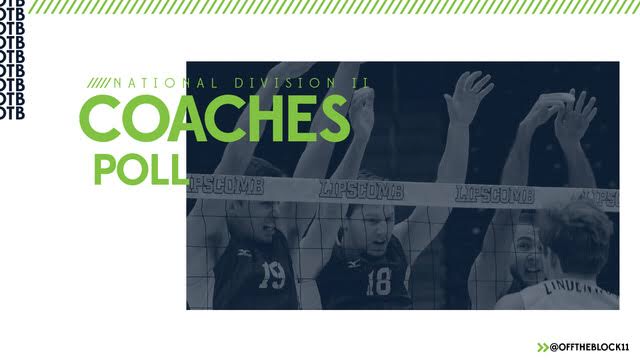 The AVCA National Coaches Poll ranks the top 15 Division I-II men’s volleyball teams and is released each Monday during the regular season. A national voting committee comprised of coaches from the more than 20 Division II teams determines the weekly rankings for the Division II National Coaches Poll. Off the Block is a website that launched in 2011 and is the nation’s leader in college men’s volleyball coverage. Springbak, Inc. is the official sponsor of the Division II National Coaches Poll and produces high performance footwear used by professional athletes from the NFL, NBA, MLB and U.S. Olympic teams and the top college teams in the nation. The Division II National Coaches Poll will be released on the Off the Block website every Tuesday during the regular season.